Ganesh on elephant, ganesh, god ganesh, lord ganesh. 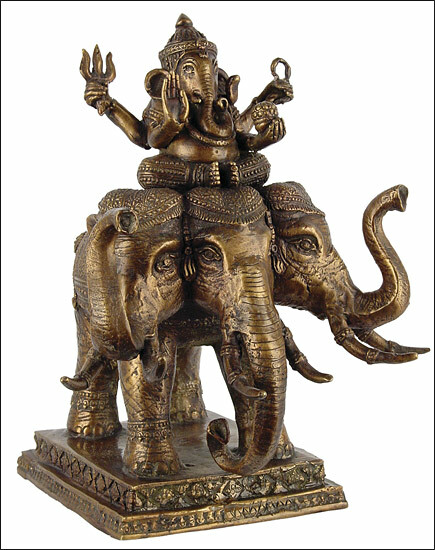 Ganesh, also called Ganapati, the elephant headed God of Wisdom and Success is the defender and remover of obstacles and has to be propritiated first before worshiping other Gods. He is one of the sons of Shiva and Parvati. He is known as �Sidhi Data� or bestower of success in the work. His elephant head is believed to be an emblem of wisdom. His head often has one full tusk, while the other is broken. It is said that he lost it in a fight or that he used it to dictate the Maha-Bharata to the sage Vyasa. His mount or standard is a rat, a symbol in Hindu fable of the Sagasity & trickery of this world, much like the fox in the west. So it is natural that the rat should first be conquered, then subdued and employed by the being who represents spiritual strength, whom he was bound to recognise as his superior, since his own cunning would tell him that Ganesh would prove a better guide than even his own perspicacity.